Resulting from a slow-growing, non-cancerous tumor on the main nerve going from the brain to the inner ear, acoustic neuromas (vestibular schwannomas) can result in some degree of hearing loss. While uncommon, the condition can place significant pressure on a nerve that affects both balance and hearing. It is often an MRI that results in a diagnosis. This condition is managed primarily by a neurotologist who is an ear nose and throat specialist who subspecializes in the ear and tumors of the skull base. Believed to be the result of a genetic error, the exact cause of acoustic neuroma is not known. The condition occurs in approximately 1 patient per 100,000 individuals each year. It has also been linked to patients with neurofibromatosis, a genetic condition noted for high instances of tumor formation around nerves and the brain. 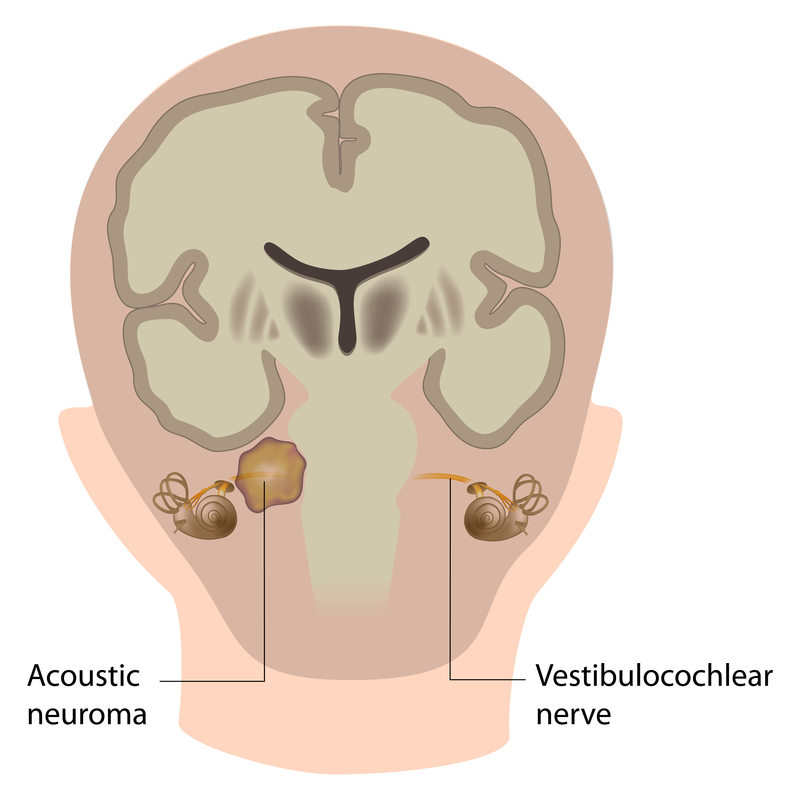 An acoustic neuroma is often characterized by one-sided, or asymmetric, hearing loss. Nerve pressure from the tumor may result in difficulty maintaining balance or facial numbness. Hearing loss some patients have with acoustic neuroma can be either progressive in nature or appear suddenly if the tumor increases pressure on the nerve. Some patients may experience dizziness or one-sided tinnitus, a ringing in the affected ear only. Radiation in the form of stereotactic radiation may be used to stop growth and sometimes shrink the size of the tumor. Radiation is generally recommended for patients with smaller or medium-size tumors, radiation may also be the preferred option for patients with other issues that would make surgery too risky. In patients with a smaller acoustic neuroma (2 cm) or those with advanced age, acoustic neuroma, a wait-and-see approach can be taken. Monitoring includes observing the tumor with an MRI scan every 6 to 12 months to determine how much growth has occurred. Patients will also be asked to report new or worsening symptoms. Large tumors (>3 cm) generally require surgical removal. The type of surgery necessary to remove a tumor not responding to other treatments is determined by the location and size of the tumor at the time surgery becomes necessary. Done under general anesthesia, the procedure is often performed with neurotologist and a neurosurgeon. Advancements such as assisted navigation and ultrasonic bone removal have made surgery for an acoustic neuroma safer for patients. Initial diagnosis often starts when a patient is referred to an ear, nose, and throat doctor if their primary care physician suspects some type of hearing issue. An ENT specialist makes a diagnosis by evaluating a patient's medical history and reported symptoms. Testing often involves a hearing test and an MRI to confirm the existence of the tumor and determine its location. The early diagnosis of an acoustic neuroma may prevent serious issues with hearing loss oftentimes experienced during later stages of the condition.